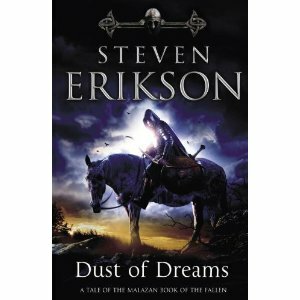 After a hiatus of about five months, I’ve returned to Steven Erikson’s stunning epic The Malazan Book of the Fallen with his ninth and penultimate volume, Dust of Dreams. You might all think I’ve forgotten most of the story since it’s so cunningly complex, and yes, I did get a little confused at times, but the feelings you get when reading Erikson’s work, the excitement, the passion, the realisations, the sorrow, never quite leave you and soon I was back into the throng of things. The previous novel, Toll the Hounds, left me feeling rather bereft and unsure as to where the story was heading. But Erikson is nothing if not a master of weaving tales. But I also know that he’s not one to reveal everything in one go. He’ll feed you a tantalising glimpse one drop at a time. In Dust of Dreams, the Malazan forces under the increasingly isolated Adjunct Tavore Paran are getting bored waiting in the city of Letharas after the defeat of the Tiste Edur and their mad emperor. Letheras has a new ruler, the mad but benign genius Tehol Beddict who is cunningly restructuring his beloved city into something peaceful and economically sustainable. As Tavore tries to put her secret plans into action, she slowly realises that she is not quite alone as her faithful soldiers, the Bonehunters and the surviving Bridgeburners, begin to fathom the desperate choices and gambles she has been making. As they awaken to the possibility that their leader may actually know what she is doing and that she may be fighting against the game the gods are playing with the humans, the Malazans begin to march into the Wastelands to Kolanse where a hungry power yearns to be free. Only Tavore knows what awaits them. At the same time, the elder gods are unhappy at being sidelined by the new gods and ascendants that are crowding their space and want some of their old powers back. As the convergence that has been brewing gathers force and the tangled strands of Erikson’s story come together, the T’lan Imass are re-awakened with the First Sword, Onos T’oolan baying for vengeance. The K’Chain Che’Malle are looking for a human Shield Anvil and Mortal Sword to lead them into battle and the dreaded Forkrul Assail are spreading their justice across the land, blighting everything in their path. Are they what the Malazans will be facing? Can Tavore realise her hidden plan and save her soldiers? You must read on to find out! Dust of Dreams is essentialy part one of the finale and ends on a cliffhanger to be continued in The Crippled God. But even though it’s not as complete as one would have hoped (well, none of the Malazan books are as the main story is EPIC, I tell you) I didn’t find it an issue. As this is a 10 volume series, I would expect each book to add to the story’s continuity. A big part of the story is the dissatisfaction of the Malazan troops as they are garrisoned in Letheras while Tavore decides what to do. Idleness is the enemy of the soldier, as they say, so it was interesting to see how the soldiers, who come into their own in battle, deal with having time on their hands which adds to their growing unease and faith in their leader. But as I said before, I love the banter between the Malazan soldiers and I especially like how strong the female characters are. In this part of the tale, we learn more about the mysterious lizard creatures, the K’Chain Che’Malle with their mad Queen who are trying desperately to avoid exctinction. I am still foggy about the Forkrul Assail, but I’m sure we will see more of them in The Crippled God. And we see glimpses of the ascendants and figures from the dead as Hood, the god of death, no longer holds his throne. And we are reunited with old friends such as Onos T’oolan, Toc the Younger, Mappo the Runt, Icarium Lifestealer even though they are heartbreaking. What can I say? If you haven’t started reading the Malazan books, you are MISSING OUT. Night of Knives – this one is set just after the prologue of Gardens of the Moon and before the main events so should be read after the first volume by Erikson.